Welcome to the June issue of our Link Ethiopia news updates. We hope that you will enjoy reading about our latest developments. In particular, if you have any London connections please see our appeal for small office space. We are planning to develop and expand our activities over this coming year and we need your help! Now here’s a big request. For those of you in business or having contacts in London, is there any possibility of your helping us to find office space for three or four people in central or north London? We need to find a company who would like to help our charity by allowing us to use a small office space for our work. With such a space, we and our volunteers could expand our activities and make our work really effective. It is good to see that environmental issues are a big concern in the beautiful land of Ethiopia. A new book, published in Ethiopia, is called “Environment for Survival” and focuses on five major ecosystems in Ethiopia that are endangered. It mentions, for example, the highland ecosystem, where about 80% of the native population are leaving and where there is a high level of erosion and environmental degradation. Let’s hope that such concerns are treated with real urgency – as we hope they will be elsewhere in the world. It has also been reported that Ethiopia will receive the highest share of the $30 billion that was proposed in May to the US Congress to reauthorize the Emergency Plan for AIDS Relief. This money would be used to support treatment, to prevent new infections, and to support care for those in need, including many orphans and vulnerable children. Visit Ethiopia, be 7 years younger and get up at ‘midnight’ ! Most of us know that time differs across the world with degrees of longitude but in Ethiopia there’s somewhat more to it! Ethiopia uses the Julian calendar which is roughly 7½ years ‘behind’ the western Gregorian calendar. This means that the Ethiopian New Year starts on 11 September and, rather excitingly, this year the country will be celebrating the millennium! An Ethiopian year consists of 12 months of 30 days and a 13th month of 5 or 6 days. This is all because of Julius Caesar and a dispute over the exact date of Christ’s birthday. Then there is the time… If your clock is set on Ethiopian time it is based on a 12 hour day where 1 o’clock is daybreak (7am in the UK) and 12 o’clock is when dusk falls (6pm in the UK). So when visiting Ethiopia it’s best to say ‘in the morning’, ‘in the evening’ and ‘at night’ to indicate the time of day. You can deduct 6 hours from your 12 hour clock to get to local Ethiopian time. And that’s not taking into account the time difference! The school link which started it all – Dr Challoner’s Grammar School in Amersham and Fasiledes School in Gondar – has continued to thrive for more than ten years. During this time Dr Challoner’s students have worked hard to raise money for their Ethiopian counterparts. Amongst the more innovative ideas has been a seven course banquet of food from around the African continent – cooked by the students and their parents – served to the sounds of African drums in a hall decorated with masks and artefacts. The results of the students efforts are perhaps most visible in the recently completed school library, which is the first new building in the Fasiledes Secondary School since the Italian Occupation during the Second World War. Fasiledes has always been kind enough to provide us with a base for our Gap volunteer teachers to conduct their lessons, and our volunteers enjoy teaching such attentive and eager students. Moreover, the link has been strengthened by reciprocal teacher visits, as well as a number of student group visits from Dr Challoner’s to Ethiopia, which has enabled both sides to experience life in their link school first hand. 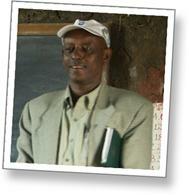 Schooling in rural areas of Ethiopia is gradually increasing. A year ago we visited the first school within the Atakilt community, which is located in a rural setting about 40 minutes from the nearest school on the outskirts of Gondar town. We joined with the local community to fund the building of two new classrooms and in April this year we re-visited the school to see these new buildings which have now doubled the school’s teaching capacity! Can you help us to support the Akakilt community in the future? Two of our recent volunteers, Avi Bram and Matthew Hunt, are now safely back in the UK after a successful and highly memorable three months in Ethiopia. They were pioneers for Link Ethiopia in the Azezo Secondary School and had a warm and supportive welcome there. They lived on the edge of the village of Azezo, in accommodation supplied by the Blind School – itself run by three Catholic nuns. There is no doubt that we shall be looking to repeat the placement in the coming academic year. 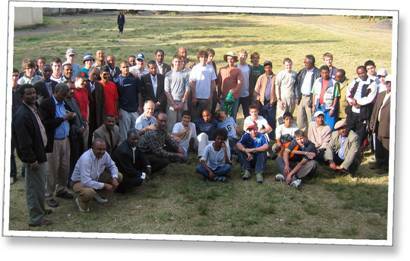 And this reminds us – there are still two places available in Ethiopia for the autumn session of 2007. If you know of any young people who might still be interested at this late stage, do let us know speedily. 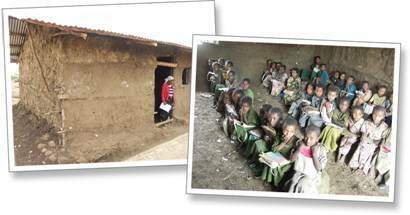 The photos were taken in and around our Gondar schools by Richard Woods. Packs are on sale at £5 for 5 cards with at least £3.50 going towards our projects. Email us now and we’ll send them to you! As always, if anyone reading this would like to offer us expertise, knowledge and help with our work or would like to associate yourself with one of our school projects (classrooms, water, toilets, books, etc) then please get in touch. You can donate via the following link, or by contacting us – details at the bottom of this email.